The Palace and Park of Versailles have had a large influence on the artistic form of other palaces and gardens in Europe. It is a symbol of the system of absolute monarchy and its court life of the Ancien Régime. The Palace started out as a small royal hunting lodge. From 1661, King Louis XIV expanded into one of the largest palaces in the world, and moved his court and government to Versailles. Versailles became the unofficial capital where government affairs were conducted during the reigns of the Kings Louis XIV, XV en XVI. It was used intermittently between 1682 and 1789. After the First World War, Versailles hosted the opening of the Paris Peace Conference in 1919. Germany was blamed for causing the First World War in the Treaty of Versailles which had to be signed in the same room on 28 June 1919. I just did all that on a Sunday morning in December. There were about 40 people waiting at the gate at 9 a.m., including a Chinese tour group. I beat them all at the start, was the first to go in that day and had the rooms almost to myself. The gardens open already at 8 a.m., and I wandered around them a bit before visiting the interior. It was quite foggy, but that gave an extra mysterious touch to the surroundings. 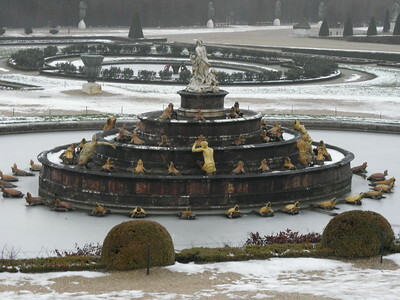 The grounds were still muddy and slippery from the heavy snowfall that had struck the Paris region last Wednesday (and even caused the Palace to close for half a day). A large golden sculpture by the Japanese artist Takashi Murakami attracts a lot of the attention at the moment. It is part of a temporary exhibition, his works are also in the interior of the palace. The Palace of Versailles was well known to me from history classes in school, and I found the interior of the palace, and the magnificent Hall of Mirrors in particular, to be as awe-inspiring as I'd hoped when I first visited in the fall of 2003. I was just as enthused to visit the renowned gardens, after having already seen the gardens dubbed the "Russian Versailles" at Peter the Great's Peterhof palace outside St Petersburg. The gardens at Versailles were as expansive and impressive as expected; unfortunately I missed the fountains, which were not scheduled to run on weekdays in the fall. Two years later when I visited Paris again, I made sure to plan a trip to Versailles on a summer weekend to see the fountains running. This time, the gardens were more crowded, but they also seemed more lively as the fountains soared above the basins and ponds throughout the grounds. Although I liked Peterhof's smaller, more intimate sea channel, the Grand Canal at Versailles provided an impressive main avenue with numerous side trails serving smaller gardens and grottoes. The Palace of Versailles is one of the best palaces I've seen in Europe, and I highly recommend timing a visit when the fountains are on full display in the gardens. Logistics: Versailles can be reached by the RER C rail line from Paris, but it can also be reached via private transportation. Versailles, the symbol of absolutism and decadence, a highlight of Baroque architecture, and a must-see, even if you are (like me) not very enthusiastic about visiting palaces. Once it was the royal palace of the Sun King Louis XIV and his successors, now it is occupied by the ‘common people’ – tourists, crowds of tourists from all over the world. To avoid the crowds, we followed the advice of Els with the exception of no. 1: our visit was in early September 2015. Our hotel was in walking distance of the palace and we arrived at the entrance half an hour before opening time. After passing the security check, we went quickly through the first rooms and headed directly to the Hall of Mirrors. For a few minutes we had the gallery almost to ourselves. We only had to share it with the guards, but they readily stepped aside so that I could take photos of the deserted hall. Then we visited the other rooms, first the apartment of the king and the rooms in the Queen's wing. Again, we were almost alone in the rooms, but when we went back to the first rooms for a second and closer look, it was hardly possible to get through the oncoming crowds. Each room was crammed with visitors, so we gave up and left the interior. I agree with other reviewers that the Hall of Mirrors is the highlight of the palace. The rest is more or less the usual sequence of rooms, certainly larger and more luxurious than elsewhere, but nothing special. We spent the remaining day in the Gardens of Versailles. The park has an enormous size, it is more than three kilometres from the palace to the end of the Grand Canal. We walked about two thirds of the distance along the channel, here you find only a few tourists, no large tour groups, only some cyclists and strollers, no trace of the hustle and bustle at the palace. But even if you don't want to hike so far, you can spend hours exploring all the fountains and other small architecture in the French Garden. I liked best the Enceladus Grove, the fountain depicts the fallen giant sinking in volcanic lava. Also remarkable are the Ballroom and the Colonnade Grove. The cherry on the cake was the temporary exhibition by Anish Kapoor, one of my favourite contemporary artist. Five installations were shown in the gardens and a sixth in the nearby Salle du Jeu de Paume. The photo shows the "Sky Mirror" in the foreground. Nothing particularly fascinating about Versailles with the exception of two specific elements. 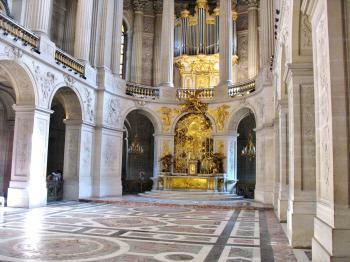 Firstly, the Royal Chapel is stunning. Surprisingly, during my visit it was all but deserted. Secondly, the vast garden which has some extraordinary portions which plainly stated, is a truly beautiful landscape. The Hall of Mirrors while stunning is often far too busy. If I returned I would spend almost my entire time exploring and photographing these two elements of Versailles. The main portions of the palace, while the prototype of countless European Palaces, is rather stark. I visited this WHS in August 2012 by car. I went there early and bought the tickets online to avoid long queues. There still was quite a queue already at 08.30 although the palace opens at 09.00. I explored the royal courtyards and gates before entering the historic palace. 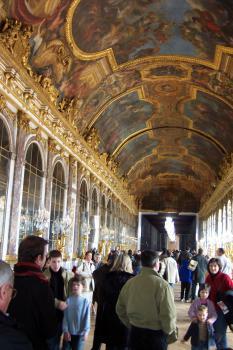 The Hall of Mirrors and the Queen's Bedchamber were the highlights of the Palace although crowded. However, the highlight of this WHS for me are the enormous gardens with fountains and the canal. I walked to the Petit and Grand Trianon and visited both together with Marie Antoinette's Estate and the Queen's Hamlet away from the crowds. Very peaceful to walk around and interesting monuments (such as the Temple of Love). This is an amazing part of world heritage history! I believe that this is one of the most fantastic structures i have ever seen! I am not a big fan of Palaces, however Versailles made it on to my list of visited sites for perhaps being the premium example of the European Royal Palace, it is the point of reference for all the grand residences on the continent and beyond, and I am pretty sure that if the WH list was just an exclusive list of the best example of certain types of building, this would be the one that would be inscribed. The palace is the absolute height of Monarchical absolutism and Baroque decadence. This was essentially the seat of French government until the revolution, as Louis XIV proclaimed 'L'Etat, c'est moi' (I am the state). Every wall ceiling and floor space seems to be crammed with decoration (I must admit to not being in the best shape to view this as we were hit by a particularly dizzying bout of seasickness whilst in the royal apartments). The Hall of Mirrors (pictured) was pretty astounding, even if only half is currently visible, as there were very impressive restoration works whilst we visited. This is also where the famous Versailles Treaty of 1919 was signed, one of the most important moments in modern European History. The royal apartments were the usual parade of bed chambers and anti rooms with paintings of princes walking their favourite dogs. The Battle Gallery is an impressive pictorial account of French military victories. The grounds were massive and well worth spending a few hours walking around. We visited in winter so the fountains were offm the statues covered and the trees bare, but it was still a pleasant way to spend our time and entry was free. I was also quite surprised to find that the surrounding town was also very well planned and much in keeping with the Palace itself perhaps worth exploring. Versailles is easy to reach from central Paris especially by rail. I am sure the site is always busy as it was on a Thursday in February but it is defiantly worth a visit and I am pleased that I have seen it but it is not a site I think I could even grow to love. I went to Versailles when I was 14 but the Hall of Mirrors and the gardens are what I remember most. Spectacular! WOW. This palace is hectic. To tell the truth i never even knew it exhisted until i got it for my World Heritage Site assignment. Its sctructure is extraordinary. It would be a wonderful opportunity and experience to go and visit this place one day. I'm only thirteen and im pretty sure none of the kids my age would know about this astonoshing palace, if they did i think they would have the same reaction as i did. I'm really glad i got this for my assignment. Hi im 12 years old and at first the palace of vrsailles was really boring but then when we started learning about the french revolution in history it became clear to me i was finnally understanding and it was actually really interesting. It was amazing to see how the french king and queen were living with all their gold furniture, painted roofs and amazing gardens while the rest of the counry was dying on the streets becuase they were all homeless and starving that so many of them died. I hope pur country will never end up like that. Versailles is the model after which most European royal palaces were modeled, from Schönbrunn to Caserta and Drottningholm, but none quite matches its splendour and simple greatness. It is just vast in every respect, including the gardens that are about the size of Liechtenstein. The interior is just as impressive as the exterior, and its opulence and ornateness are hard to describe. 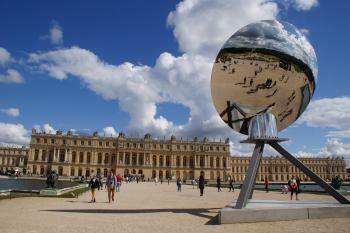 Versailles is so well known that it is on almost every tourist's trail, and it shows. I was there twice, once in June and once in October, and both times the number of visitors was just incredible. So to experience Versailles at some amount of solitude, you probably have to come one early February morning, but nonetheless Versailles is a must-see, even with tens of thousands of other people sharing your visit. This is truly worth the visit, and still costs a very reasonable amount. EUR9 at the time of writing for the palace and its gardens. You can reach there using the metro, the stop is the last one on that line, Versailles Rive Gauche (now, maps conveniently state "Chateau de Versailles"). Do not get off on the earlier halt, also called Rive Gauche. The Chateau is only a very short walk. Just turn right from the main entrance from the station and then turn left. You will see the walk up to the palace. There are souvenir shops on both sides of the street. The palace grounds and gardens are awe-inspiring. You can spend a week here, but I had about 6 hours. Be sure to rest occasionally, or better use the mini-trains if you are not used to walking. The length of the tour is supposed to be 5km. The gardens seem to stretch as far as the eye can see, with lakes and ponds with little boats on them. 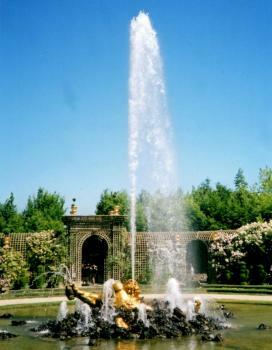 There are innumerable bronze fountains in the gardens if you walk in any direction, several large sculptured fountains in the walk directly facing the rear of the palace proper. This is one of the most awesome palaces I have ever been to, only Sanssouci in Potsdam, Germany may be slightly bigger in area if you take the new palace and the whole park into account. The state rooms themselves are gilded and very ornate with quite a lot of Louis XIV furniture, but perhaps not as ornately as say, Windsor Castle's restored wing and Schönbrunn in Vienna. The rooms are also always very crowded and you can keep bumping into people taking photographs if you are not careful. There is a war gallery, which has art depicting great French battles from the 5th Century to the 19th. Be sure to spend some time in studying these giant canvasses. They are as interesting as those in the Louvre in central Paris and the Getty in L.A. Horse Stables: Now the "Academie du Spectacle Equestre"
Equestrian Statues: Louis XIV (1836). in 1816 Louis XVIII commissioned an equestrian statue of Louis XV for Place de la Concord and the horse was sculpted by one artist. In the end a different "king" was seated on the horse, sculpted by a different person, and a different location was chosen! Treaties: Treaty of Versailles 28 June 1919. In Hall of Mirrors. Naser ed-Din Shah: "Again another day we went to Versailles ... We passed through a gallery where were arranged most beautiful statues in marble of ancient kings, ministers, magnates, commanders, and the like, all carved by the old masters;"
640 Community Members have visited.